Geneva Platinum CZ Accented Watch Just $3.92 SHIPPED! You are here: Home / Great Deals / Amazon Deals / Geneva Platinum CZ Accented Watch Just $3.92 SHIPPED! I haven’t worn a watch in years, but I’ve been thinking about getting one. 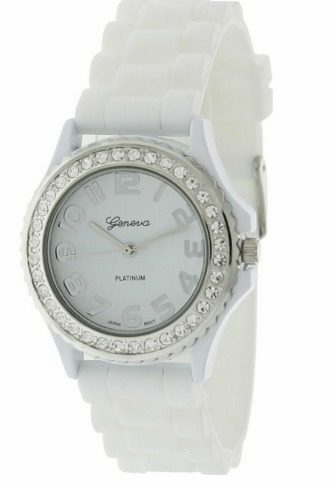 This Geneva Platinum CZ Accented Watch is so cute and right in my price range! Pick it up for only $4.49 plus FREE shipping on Amazon. I LOVE the crystals around the watch face. They make the watch so blingy and make it look like it costs so much more than it actually does!